Jericho, in the Palestinian Territories, is best known as the city where Joshua “fit the battle” and the “walls come tumblin’ down.” Archaeologists cannot confirm that famous Biblical story, but did unearth a tower that held a world’s record for more than 5,000 years. Located in the Judean Desert, Jericho is known as the “City of Palms” because of its lush landscape, watered by underground springs. Nomads attracted by the springs founded Jericho in about 10,000 B.C., creating one of the world’s first permanent settlements. By about 9400 B.C. the residents of Jericho erected the world’s first city walls, protecting themselves from hungry thieves. Archaeologists have uncovered more than 20 successive Jericho settlements, each built over the ruins of the one before, eventually creating a six-acre tell (mound) of dirt and rubble. In the 1930s, John Garstang, an archaeologist excavating at Jericho, uncovered walls that had suddenly collapsed, which he believed demonstrated the truth of the Biblical account. 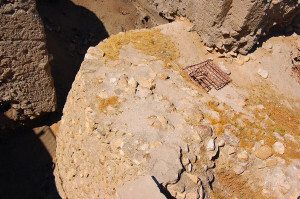 In the 1950s, Dame Kathleen Kenyon, a British archaeologist, made a systematic study of Jericho’s walls and concluded that they had fallen, perhaps as the result of an earthquake, hundreds of years before the presumed date of Joshua’s battle. She also concluded that Jericho was not occupied at the time of Joshua. Subsequent investigations have confirmed her conclusions, which few scholars now challenge. During her excavations, Dame Kenyon found a cylindrical stone tower about 26 feet high and 28 feet in diameter just inside the oldest Jericho walls. The tower, incorporating an internal stairway, has been dated to at least 8000 B.C., making it perhaps the world’s oldest man-made structure. Archaeologists originally thought the tower had defensive or irrigation functions, but recent studies suggest it marked the summer solstice. Whatever its purpose, the Jericho tower remained the tallest man-made structure in the world until about 2650 B.C., when it was surpassed by the stepped pyramid of Djoser in Egypt. The walls of Jericho probably didn’t “come tumblin’ down” as the old spiritual celebrates. Jericho is nonetheless important to understanding how human beings first began creating what we now call civilization.